but as you know, they all seem to mysteriously shrink in storage......funny that! Fair to say there's a big demand for retro shirts amongst certain fans. Toffs Bukta badged retro shirts whiz all over the unbadged ones sold by the club at one point, often wondered why Toffs can and Wednesday can't/won't with that particular kit???? Anyhow, I believe our club made a bit of a song and dance about appointing a new person into merchandising a while ago, finger on the pulse etc,...….. This is the club that has in house kit manufacturing (from...….Australia!!!!!) that threw sizing out of the window and just went with Asian sizes, or close to them and last season didn't have any larger sized shirts in for 9 months...…….so thank god they appointed someone...…..or did they?...…….no stocks of retro shirts for six months plus (I know these aren't made by elev8) but why isn't stock available?......and nobody at S6 gives a rats bottom. Cue an enterprising guy...….from Australia again, not advertising for him because the club has threatened him with legal action over his oh so nice, but oh so knock off items, making and selling his own very accurate shirts with embroidered logos and badges, he also does the Blunts, the Dingles and Toytown, so a Yorkshire lad in exile I reckon. So good on him I say, he's tapping into a demand that doesn't exist according to the club if you look at what they are offering in the megabore…..unless you knock a few up yourself to sell to like minded fans...……………..then you are threatening legal action...…...So offer the fans some official ones!!!!!!!!!!!! 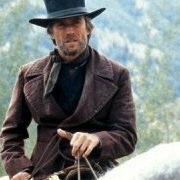 So Mr or Miss merchandise guru for our team...…………….where are they? The 1991 retro shirts in the club shop are terrible, look like they're covered in white dots. Fortunately I can still just about squeeze into my original, but most of my others from that era have fallen victim to that strange shrinking in storage affliction. Compare the Sanderson era shirts to todays sizes...……...whats going on there then? lol...……..are people really all shrinking? I'm not an expert but possibly Puma, Umbro, Diadora etc. might not want to print them or allow anyone else to either. Dead right...…….that's why the ones in the store don't have umbro on......I bought an umbro Iron on and an Asda six months ago waiting for larger sizes to come back in...……….still waiting...…..might be a very long wait! Again, not advertising...……..but these are classy for,...……... let's call them tribute shirts! Thanks for your comments Hirsty. Come on share the link I want to buy one! Seen them on eBay but not paying £100 for one. Has he got a site? Yep I was going to make a post a little similar to this though moreso warning people to be wary. I have an original 87 away shirt, which my Mrs got me for my 21st 10 years ago as I was born in 87. Have taken it on every holiday since so some good memories linked to the shirt. 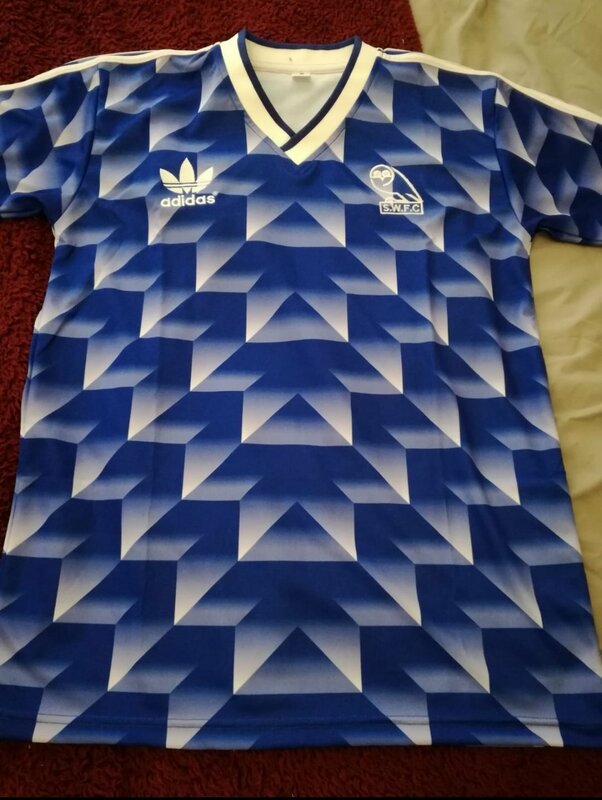 A mate has bought the silver away shirt from @FMConline87 it is an incredibly good copy of the original. For anyone who doesn't know the finer details of the original it's difficult to tell the two apart. However my advice would be if it says Finlux on the front it's highly unlikely to be an original. 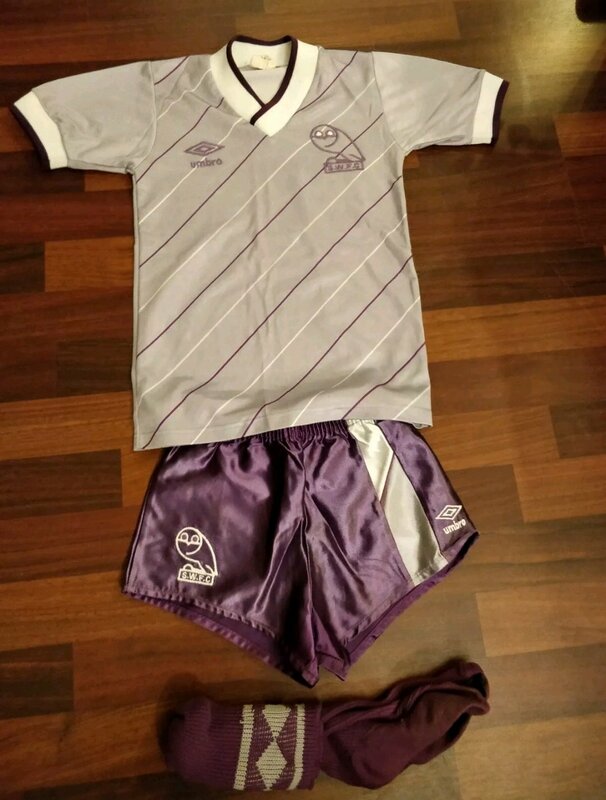 As to my knowledge only the match shirts had the sponsor and 87 replicas had no sponsor. These modern copies are a little thicker in material. Also although the modern ones have an umbro logo on the front they dont have an umbro tag on the inside neck. Essentially if you were buying one online the only way to really tell it isn't original is if it's got Finlux on as unlikely to see detailed pics of inside neck. On this item only when you go into the description separate from the screen above do you see it is a modern version. Be wary as the originals do sell for £200 plus. 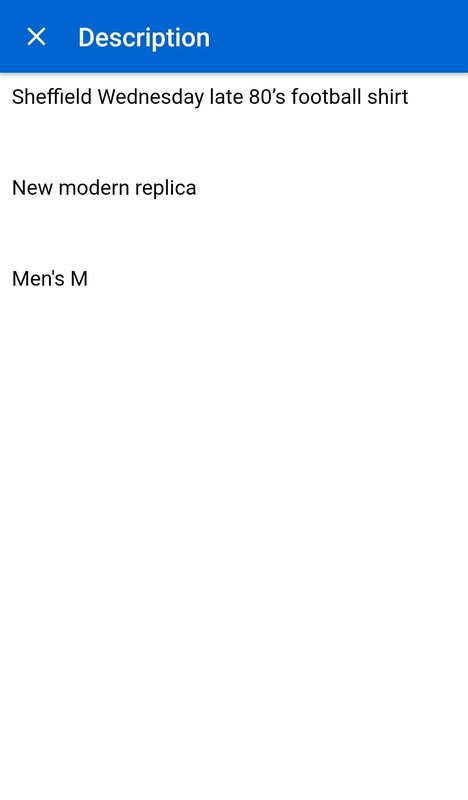 Someone may be happy to pay £60 for the modern replica though in doing so people should be wary what they're purchasing. Try www.classicfootballshirts.co.uk. 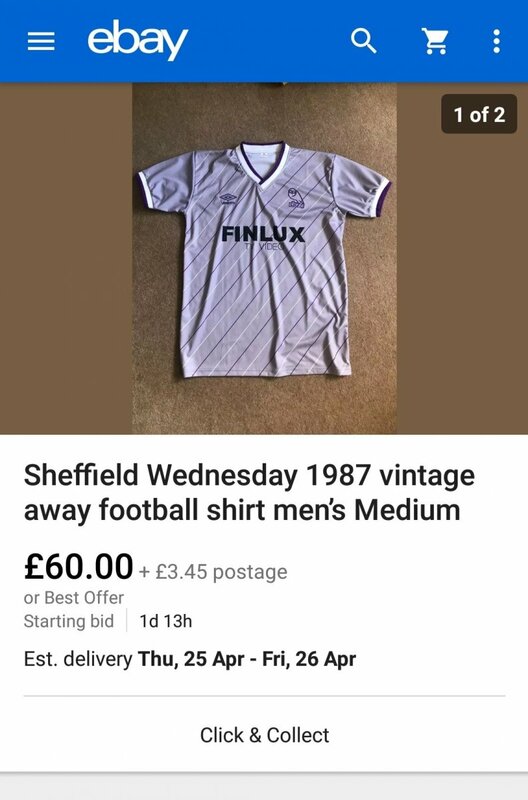 Lot's of Wednesday stuff, no reproductions, originals, and at fair prices, in many cases not as much as the retro shirts issued by the Club this year. They've done us in the Denmark 86 shirt as well, my favourite football shirt as a kid. Nick, have you got fullstopitis......................? There's some good ones on here, a bit pricey though. 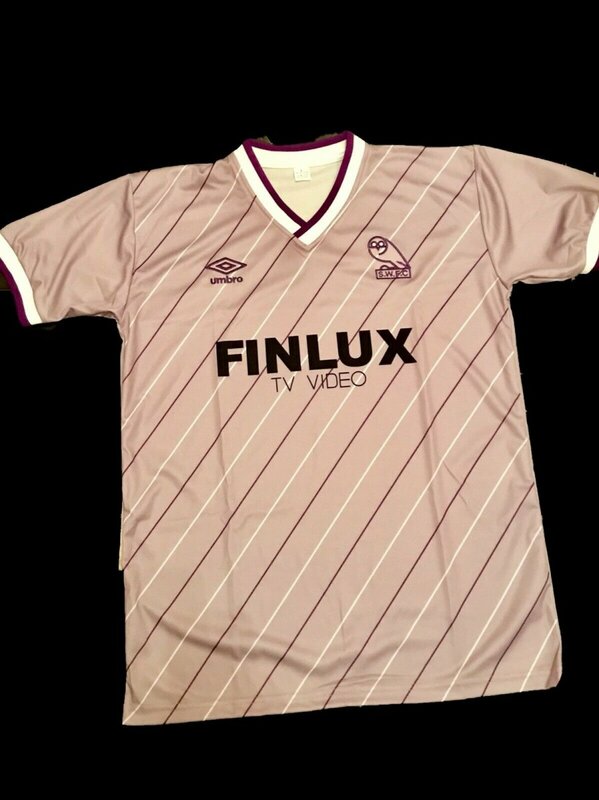 I bought myself the 85 Finlux sponsored home shirt, it’s class . Where did you buy it from?